We offer an extensive selection of parts to fit your Performance and Off-Road vehicle and we can usually get the parts next day from many of our local suppliers. Give us a call to transform your ride today! 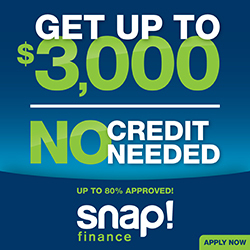 We now have NO credit check financing! We finance TUNES, EXHAUST, INTAKES, SUSPENSION, WHEELS/TIRES, AND MORE! Click on the image below to apply.